Yugi was just your average Beast Tamer trying to get by in life. After one fateful encounter, he finds his world beginning to turn upside down, and everything he though he knew was changing. But there are secrets hidden behind everything, and not everyone is who they seem to be. The mysteries of the past begin to unearth themselves, and Yugi will have to decide just who he can trust among the deception and shadows. October 2017 edit: Hey wow time flies, been a while since I wrote this. I've improved a lot since these early days of multi chapter writing, but have decided to leave these old works up as an archive, to keep to show myself my improvement over time, but also because it would be pretty sucky to delete it if people enjoyed the fic. So if you're reading this post my edit, it's an old work, as a fair warning. It's choppy at times, but it's still a finished thing, and I'm proud I stuck through and completed it. Hope you enjoy The Living Daylights! Original 2015 Note: This is a fic I have been working on on and off for the past five months. The story and plot was developed by myself and KarenR2(AKA Renrink over on Tumblr), and I've been doing the writing~ All the art featured in the chapters is all mine too, I've tried to include some scenes in there to help give the story some more life (plus I just really wanted to illustrate it :D ). I should probably also point out that the pairing side of this story will only be implied, because I cannot write romance to save my life. Action and adventure I'm good with, romance, ehhh not so much ^^;; Also every chapter will be named after a song, because why not? It was another bright and yet pleasantly cool morning when Yugi arose from his sleep. He propped himself up on his elbows as he groggily wiped away the remnants of sleep from his eyes. An early morning breeze playfully tussled his hair and brushed against his skin, causing him to shiver at the goose bumps now forming there. Resisting the urge to curl back up into a warm cocoon of skin and cloth, Yugi pushed himself up from the ground and stood, the cloak he used as a blanket pulled haphazardly around his form. He figured that he had better get dressed to avoid any unwanted illness creeping up on him, so he moved toward where he had left his bag to rest the previous night. The camp he had set up consisted of his sleeping mat arranged under a tree, and a tiny fire lined with stones, to prevent flickering embers catching on the nearby grass. The flame has long since burned out during the night, and all that was left was a collection of charred sticks of wood. His knapsack that carried all his worldly goods was wrapped in his leather belts, tied to the underside of a branch on a nearby tree. All in all Yugi thought it was a very nice set up, and wasn’t on something as obvious as a clearing or field, where any old bandit could rob you out in the open. Yugi could never understand how people thought it was a good idea to camp out in the open so much. If he was travelling in a big enough group, then he might understand, but when he was travelling solo, he tried to stick to the dense forests as much as possible. But then, not many people could understand why Yugi did that when he had told them. Maybe it’s a tamer thing, Yugi thought. Every tamer knew that open fields attracted monsters, and unless Yugi was purposely searching for one, he tended to like not attracting unwanted attention. Most beasts could smell a tamer, and most seemed to be not partially fond of them. Yugi had once had a run in with a wild boar that, when it had taken the slightest whiff of Yugi, had gone into a raging stampede, crashing into anything and everything in its sight. After that meeting, Yugi had made sure to keep his beastly encounters to run on his schedule, only approaching those he needed to. Of course the scent thing could work both ways. Yugi could quite often distinguish the scents of different beast types, and could usually tell what species of beast it was too. A skill that he did not share with many other beast tamers, he had begun to realise during his years of travel. It seemed that the tamers that were capable of such abilities were the ones who more often than not had spent most of their lives travelling alone more than spending time with other people, a trait that Yugi definitely shared with them. Yugi liked to consider himself a people person- after all, most people he talked to told him he was a pleasure to be around. His comments were always positive, and his nature was friendly and kind; his whole person seemed to radiate a kindness most people had never seen before. But as much as Yugi could hold a conversation, he found that most people treated him as if he was less than him, and, much to Yugi’s constant displeasure, as a child. Sure, they would invest time into talking with him, but to them Yugi was just a little kid, no more than a distraction from some mundane thing in their lives. And when Yugi needed help or something from them, it was one convenient excuse after another, ‘sorry kiddo,’ or ‘Why don’t you ask your parents sweetie?’ And so Yugi often sought out the company of a quite wood, or the peaceful serenity of a mountain’s stream. To him, even though he liked talking to people, he found it the most helpful when he was out adventuring and travelling around. He had soon realised, when he began his adventuring so many years ago, that he could never settle down to live his life in a settlement, like so many others did. He would most likely lose his mind over the mundane little things people had to do, and he would have to change his job to something that would support him in a village or city. A baker, or tailor, something boring like that. Shaking his head, Yugi chuckled lightly over his musings. He would much rather be out here, in the cool morning breeze of a forest than slaving over a hot oven to make produce. Returning to his original task, Yugi pulled his bag down, taking care not to worry the leather against the tree branch too much. The idea of one of his leather belts snapping wasn’t a pleasant thought. Leather, while not as expensive as steel or iron armour, was still quite costly to the tamer. The occasional jobs he did to earn some coins were few and far between, and meant he had to work on a tight budget. While things such food and materials were easy to gather during his travels, it was man made things that he needed money for, as he paid trips into the villages along his routes to get them. Sometimes he would get lucky, and someone in the village would need someone to deliver an item, or a beast was lurking too closer to the village for comfort. On these occasions, Yugi would be able to offer his assistance, and in exchange have enough money to buy what he needed before he could leave into the wilderness once again. After enough careful jiggling, the sack came down, landing with a thud in Yugi’s outstretched arm. He checked quickly for any signs of tampering, or anything missing, but Yugi wasn’t too worried; he knew it wasn’t common for people to come out this way, and he hadn’t run into anyone for a few days now, and besides, no one who was smart would be here now of all times, not with a dragon running loose close by. When Yugi had first heard about there been a dragon nearby, he was ecstatic. He hadn’t run into many dragons during his travels; the beasts were supposed to be quite rare in this part of Asren. And those he had run into, he had barely gotten close enough to talk to. Dragons had amazing senses, and they were very good, it seemed, at sensing humans- and, by extension, beast tamers- and most of the time they were not pleased to see them. Yugi had only ever spoken to one dragon for an extended period, and it was a conversation about why Yugi thought he wasn’t a very tasty human, and deserved to see the sun rise the next morning. But Yugi had a mission this time; he wanted to become friends with this dragon. And it wasn’t just because he had promised the nearby village that he would get rid of the ‘dragon menace.’ Yugi actually generally wanted to become friends with the beast, as he had tried many times before with others. But it seemed there was an unspoken law that meant beasts and tamers could never be more than master and, well, beast. In all Yugi’s years of travel, he had always tried to make friends with the beasts he tried to tame, and more often than not he would release them of their duty to him as he felt it was more forced than willing. He was still searching for a partner that would treat him as a friend, and not a master. The fact that he was going after a dragon was worrying, however. He wasn’t sure if he had the strength needed to tame a dragon, let alone have a conversation with it. But he couldn’t let his self-doubt get in the way of his promise towards the village. If he had to, Yugi was prepared to find a way to get rid of the beast, even if it meant, Yugi thought sadly, killing it, although he severely hoped it didn’t come to that. If it did come to violence though, Yugi was very glad he had his friend Ryou coming to back him up on this quest. And on top of that, Yugi thought, a smile creeping up his face as he began to rummage through his knapsack, finally finding his set of clothes, today is the day Ryou should be meeting back up with me. It had been a few weeks since Yugi had last seen his friend. The two of them were often travelling companions together, and would go out on quests to help one another. Such as now, when two weeks ago Ryou had suggested he accompany Yugi on his quest to hunt down the rogue dragon. Yugi was thankful for his friend’s offer, especially since Ryou was a white mage, meaning if either of them got into serious trouble Ryou would be able to bail them out with his magic. Clutching his clothes, Yugi quickly changed into them, sliding on his linen tunic and pants before putting on the leather adornments over the top. He suddenly felt a lot warmer having his limbs covered in warmer material than just the cotton shirt and cloak wrapped around him he had been wearing to sleep, and still had been until just then. Yugi grabbed said cloak that had been discarded off to the side while he changed, and shook the dirt and grass that clung to it off, wrapped the piece of material over his shoulders in a cape-like fashion. Lastly, he took the belts that had been used to support his bag and buckled them over his forearms and gloves, saving one final leather belt, his most expensive by far, to go around his neck in the fashion of a collar. He liked to have the feel of it pressed gently on his neck, in a way it was relaxing, having the familiar weight constantly there. Yugi didn’t spend too long dwelling on his thoughts, lest he run the risk of being pulled back into memories from other, more unpleasant times. Right now, he knew he had to make it to the meet up point, so he could find Ryou and continue on to confront the dragon. Gathering up his belongings and making sure he had everything, he shouldered his knapsack and began trekking through the forest, taking note of the different kinds of trees and animals that lived here. He saw a few small gash marks around the trunks of some trees, and figured them to be from deer. At least I won’t go hungry tonight, Yugi thought. He passed several berry bushes, and picked some from the plants he knew not to be poisonous. He had found some raspberries, which he was happy about, as they could be eaten by themselves if he failed to catch anything else for food. Although with Ryou coming along Yugi was bound to eat well; he was an amazing cook. Yugi had often asked Ryou why he didn’t choose to follow the job role of a chef, to which the boy had replied that he simply didn’t like the lifestyle. He was, much like Yugi, an adventurer at heart, and enjoyed travelling more than being stuck in a town. The sun was well untruly burning down from the sky by the time Yugi had made it to the landmark that would serve as his and Ryou’s meet up point. It was a clearing at the base of a small mountain that stood larger due to its location in the middle of a sea of trees. Yugi peered up into the sky, scanning for any sign of the dragon. He didn’t like the idea of been out in the open field, but it seemed that the dragon was currently not hanging around, or it was asleep atop the peak. This was certainly the mountain that the villages had told him the dragon had made its home, so it was only a matter of time until Yugi saw the beast, or at least evidence of its existence here. Now that he had arrived, Yugi had nothing better to do than sit around and wait for Ryou to get here. Since it was noon, he figured the mage would be here soon; Ryou was never one to be late. He might as well sit down and plan out the best way to tackle their dragon problem. Yugi knew that he wanted to try his best to tame the beast, so that was their first course of action, but if he failed to convince the dragon to be friends… Yugi knew it would be tough, but he would have to find a way to slay it if no alternative could be reached. Ryou would agree, he convinced himself, feeling his face twitch into a frown. It did little to settle his nerves, however, as he could feel his hands start to clam up and fidget. He shook his head, wishing the thoughts away; now was not the time to get distracted, he had a job to do. With no sign of the dragon, Yugi tentatively left the shelter of the tree line and headed out into the open plain. He sat down on the grass, wincing when the leftover morning dew soaked through his pants and cloak. He would wait here until Ryou showed up, or, if he was unlucky, the dragon. It was another hour or so of Yugi twiddling his thumbs and playing with grass blades before Ryou showed up. Yugi saw the white mage coming from his field vantage point, and he stood and waved in welcoming to the other. Ryou gave a hesitant wave back, and Yugi waited until he had made it within speaking range to, well, speak. “Ryou, hey! Glad you could make it!” He said, clasping their hands together in a friendly handshake. The boy gave him a shy smile, his eyes warm and friendly. “Yeah, sorry I’m late Yugi; I got a little lost in the forest back there.” Ryou said, a nervous laughter escaping his lips. Yugi shook he head, looking at his friend hopelessly. “When are you not getting lost in forests, Ryou? I swear for someone who travels a lot you sure are hopeless with navigation.” He chuckled lightly, and Ryou joined in. “It’s not like I mean too, it’s just not all of us are born naturally good orienteers.” He scoffed, reaching out to ruffle Yugi’s hair, much to the other’s annoyance. It was a gesture Ryou always gave the other; it had fast become a friendly endearment to the two, and as annoyed as Yugi got by it, he was also grateful the two had this connection. He was just irritated by the fact that he was so genetically short, so even the most average sized person towered over him. Being short was not in the least bit fun, especially when it helped to contribute to the reason people never took him seriously. Ryou gave him a mocking bow, gracefully sliding his hands forward to cup around Yugi’s, a gesture commonly seen in royal courts. “But of course, my prince. Your arrival has been foretold by the mages of old themselves!” The two managed a solid five seconds of maintaining eye contact before they burst out laughing, Yugi collapsing onto the grass with Ryou following not long after. “R-Ryou,” Yugi wheezed in between fits of laughter. “Oh man, it’s really good… to see you again… I’m glad you… came on this… quest.” Ryou was equally gasping for breath, but he nodded, his eyes shining with good humour. Yugi pointed to the mountain that was looming rather ominously over the field they were in, and Ryou turned around to inspect it. Yugi dropped his knapsack and began to rummage through it, stopping when he found the rough papers he was looking for. Grasping the scroll, Yugi pulled it open, Ryou wandering closer to see what was on it. Yugi began to point to various spots around their current location on the map, listing off several possibilities depending on the environment, to which Ryou agreed to the most plausible. When the two were properly prepared, they both split up in different directions, each searching the surrounding area for signs of commonly used spots for the dragon. Yugi took the west section, which he suspected might have some burnt forestation, while Ryou left to head east around the mountain. Along the western route Yugi spotted several signs that pointed to a dragon dwelling nearby. There were a few trees with large gash marks embedded into the trunks, while others had whole heads burnt off, the outer leaf canopies having crisp, black leaves hanging off them. They were so fragile that the tiniest touch from Yugi’s hand made them dissolve into nothing. Even the shrubbery hadn’t escaped without injury, some of the bushes had been flattered mercilessly into the ground, roots and dirt scattered everywhere. Yugi frowned, wishing that the dragon hadn’t taken it’s emotions out on the landscape, he didn’t like seeing the proud nature reduced to such a state without so much as an explanation. Then again, he also didn’t like seeing a beast as revered as a dragon act so… aggressive. 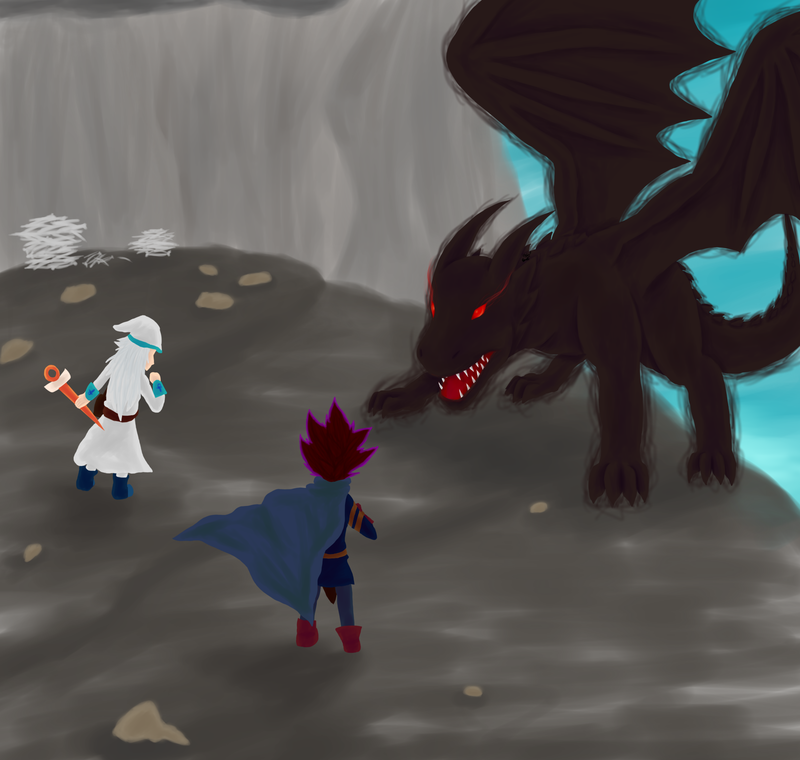 Yugi knew that it was normal for dragons to be aggressive when their territory or possessions were being breeched or in danger, but so far Yugi had yet to see evidence that this dragon had either, although it was possible that the dragon was caring for young, and that it had moved out here to this remote area to raise them. If that was so, then Yugi was even more upset at having to chase it away. He certainly didn’t want to kill it if it was a mother dragon, and no amount of money or coaxing the villagers could give him would change his resolve if came to that. Yugi just hoped that his sudden thought was wrong, and that he was just going to face an aggressive dragon that had committed some crime that made it easier for Yugi to deal with ending it, if it came to that. Sighing, Yugi continued his trek around the base of the mountain. He passed a few more burnt tree tops and shrubs, but other than that the ground forest seemed rather peaceful, not that Yugi was surprised. Any animal with even half of a brain would have cleared out at the first sight of a dragon in the vicinity. It did mean that Yugi wouldn’t be able to hunt any game while in the area. He would have to hope that what he had stashed away, and possibly any Ryou had would last them until the dragon was dealt with. Having felt that he had seen enough, Yugi returned to the clearing he had met Ryou in and waited for the white haired mage who had yet to come back. While he waited Yugi poured over the maps he had, marking places of interest and forming a plan in his head to tackle the issue. Soon enough Ryou had reappeared, walking over to join Yugi. “Just about the same as you, scorched tree tops, but only close to the mountain,” Ryou shook his head. “I’m starving, you reckon we can take a quick food break?” Yugi looked at his friend’s pleading eyes and smiled. It had been two hours since they had met up, the sun reminded him from its current position sliding down from the sky. “Alright Ryou, actually food sounds good right about now. The only problem is there’s no game around for miles.” Yugi said, pushing the maps aside in favour of rummaging through his bag. Yugi glared at Ryou, but he could tell the white-haired boy knew he wasn’t being serious about it. Yugi dished out the fruit and the two ate while catching up on life updates they had missed from each other, exchanging news and interesting things that had been happening in the kingdom. “A new pilgrimage?” Yugi asked, his curiosity piked when Ryou mentioned it in passing during their conversation. “It’s really nothing important,” Ryou shifted uncomfortably. “You don’t think I really believe that, do you, Ryou?” Yugi looked quizzically at his white haired friend. Ryou laughed, saying, “No, I figured you wouldn’t know when to stop poking into other people’s business.” The boy moved to poke Yugi in his ribs, and Yugi squeaked in shock, toppling over onto the maps he had set aside. “Ryouuuuuu.” Yugi wheezed, scrambling off the maps to push his friend in mock anger. Ryou replied with another assault on Yugi’s weak spot, causing Yugi to break out into a giggling laughter. “Stop! Ryou, I’m ticklish!” Yugi said around his giggling fits, trying to pry Ryou away from him. Eventually Ryou let up, and Yugi was able to regain his regular breathing pattern. “You still didn’t answer me, Ryou.” Yugi said, frowning slightly. Was Ryou embarrassed by his assignment? “It really isn’t that important, nor relevant, Yugi.” Ryou said with a sideways glance, gaging Yugi’s reaction. “So it shouldn’t be a problem to tell me, your friend, right?” Yugi chirped in. Ryou sighed, looking defeated, and Yugi knew he had worn the boy out, regardless of the comical battle that had just raged. “Don’t get disappointed; I told you was nothing, and don’t laugh either,” Ryou warned, squinting at Yugi. Yugi beamed back at him, feeling bubbly in his excited and anticipation. “I have to find some obscure old wizard’s out of print book from, like twenty years ago.” Yugi looked at Ryou in disbelief. This was his big secret? Yugi had to endure a tickle attack for this? “I told you it wasn’t anything.” Ryou said with a huff when he saw Yugi’s face. “Hey, I don’t think it’s that bad! I mean, it could be worse, what’s so bad about having to find some dusty old book? At least you don’t have to go fight a dragon or something.” Yugi said with a wink, and Ryou rolled his eyes. “Except I do.” The boy squinted his eyes again. Yugi held his hands up in mock innocence. “Why Ryou, whatever are you talking about? I don’t see any dragons to fight, what makes you think you have to fight one?” Yugi snickered. Ryou opened his mouth and was about to reply when an overhead screeching sound made both the boys jump and look skyward. There, in the sky, circling around the mountain that was so close to the boys’ current position, was the dragon. Yugi, from years of hunting beasts, instinctively dropped to the ground, trying his best to blend in with the grass despite his outfit’s obviously different in colour scheme. He looked over at Ryou to see the boy mimic his actions. From what he could see from the ground, the dragon appeared to be jet black, its wings and body shimmering slightly in the sun’s reflective rays. Its scales seemed dull from what Yugi could see, but his vantage point on the ground didn’t give him much to grasp at. After a few moments that seemed to stretch by too long for Yugi, the dragon stopped circling and disappeared into the peak of the mountain. There must be an outcrop or cave at the peak, Yugi thought absently as he breathed out in relief. Not wanting to wait to see if the dragon had seen them at all, Yugi grabbed his scattered scrolls and maps and stuffed them back into his back, motioning for Ryou to follow him as he dashed to the safety of the tree line. “Now that,” Ryou huffed. “Was scary. Do you think it saw us?” The boy looked worried to Yugi, even though the more Yugi thought about it the more he was almost sure the beast hadn’t seen them. But then again, he had experience with these things, while Ryou’s specialty came from magic and spells. “I don’t think so Ryou. I think we’re safe, for now.” Yugi replied, poking his head out from the tree’s canopies to observe the sky. The dragon was still in the cave on the mountain, or whatever it was that was up there; it hadn’t moved or being alerted to anything happening on the ground. It probably didn’t even care anyway, but Yugi wanted to take precautions anyway, images of the burnt tree tops flashing in his mind. Yugi turned back to see Ryou watching him, his head turned slightly. “So what now?” The mage said, crossing his arms. Yugi looked thoughtful for a moment before he replied. “I’m not sure. I guess we should climb up the mountain when the dragon leaves to scope out whatever is at that peak. We could find something worth knowing about up there… Maybe even your old wizard book.” Yugi added when he saw Ryou’s brief look of horror pass over his face. “You expect me to climb a mountain to fight a dragon? Wouldn’t it be safer to try and lead it down here?” Ryou gapped at him, oblivious to Yugi’s attempt to lighten the situation. “Well, maybe, I guess.” Yugi thought it over. It would be safer to fight down here, where they could hide easily in the trees. There was a small risk of fire damage if the dragon breathed it, but Yugi was having a hard time judging what kind of dragon it was, the colouring seemed wrong to him, slightly off. Maybe it was just the distance that had made Yugi’s eyes play tricks on him, or maybe it was a whole new species of dragon Yugi wasn’t familiar with. He didn’t like the idea of being trapped on a mountain peak with it, but Yugi wasn’t so sure the beast would fly down from its vantage point, no matter what form of noise or distraction the boys made. Some tamer instinct somewhere in the back of his mind was telling him that if he wanted this beast, he would have to come to it. Ryou grumbled something incoherently and threw his hands up. “Let me guess, you’ve got some strange sixth sense tamer thing happening. Alright, alright, I’ll do it, but if I die, I swear I will come back and haunt you.” Ryou glared at Yugi who shrugged it off with a grin. He could just imagine what his white haired friend would look like as a pale ghost. Yugi wouldn’t be surprised if he accidentally mistook him for a cream puff floating in the breeze. The two boys moved through the trees as cover as they approached the base of the mountain. Ryou took the time to pull out his mage staff from his bag, clutching it close at the ready, while Yugi just shifted into a spot with a good view of the mountain. They waited here until Yugi saw the dragon shoot out of the mountain top. With a screech, it unfurled its wings and took off in the opposite direction of the boys. “That’s our queue.” Yugi said to Ryou, who looked between the mountain and Yugi and gave an exaggerated sigh. “I can’t believe I’m doing this.” He snorted. Yugi just gave him a quick smile before leaving the tree’s cover to begin their climb. The first part of the mountain was not very steep, and they made decent progress up until the grass grew less and was slowly replaced by chunky rocks and stone. It was lucky for them that it was more of a large hill than it was a mountain. Even the rocky sections were easy for Yugi to navigate, although he had to help Ryou with his footing sometimes. They travelled upwards on the side for most of the climb, as the cliff line made for an easy spiralling path that lead directly to the top. 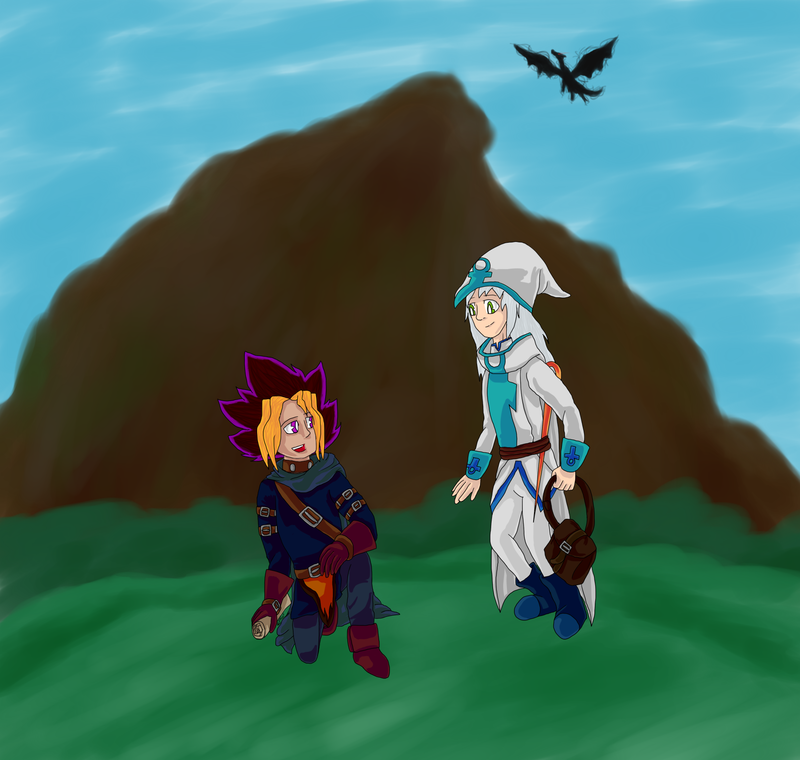 Yugi was glad that it wasn’t very steep nor large for a mountain, as he didn’t bring any climbing equipment, and the idea of having to goat climb up a mountain with Ryou sounded terrifying. “Yugi, woah wait, is that it?” Ryou touched Yugi’s shoulder lightly to get his attention, careful not to cause him to lose balance. Yugi looked forward and saw that their path opened up into what appeared to be a large outcrop of rock that jutted out of the mountain. The surface was mainly flat and empty, save a pile of bones that was stacked on the side furthest to the boys. Yugi was glad to see there wasn’t a nest of younglings here. At least he knew they weren’t going to be hurting a mother dragon. Or getting incinerated for invading their nest, Yugi thought. There was a sort of natural rock shelter above as well, in fact it looked as if a great beast had taken a lazy swipe with one claw on the mountain, and this shielded plateau had formed from it. Yugi glanced out across the sky, searching for any sign that the dragon was returning. It was too late to climb back down now anyway, they would have to find a way to confront the dragon up here, in its lair. Luckily, Yugi didn’t see any dark wings. Yugi just hoped it wouldn’t be enraged by intruders in its den. He moved forward onto the outcrop, noting the sudden rise in temperature. Even though the rock above sheltered them from the sun’s rays, the ground here seemed heated and uncomfortably warm. Ryou seemed to mirror his thoughts. “Woah, who turned on the heater, it’s the middle of spring, geez!” Ryou tugged uncomfortably at his long mages robes. Both of them were covered head to toe in garments, and the heat was causing them to sweat more than they already were from the climb. “It must be from the constant presence of the dragon.” Yugi reasoned. A dragon usually gave off a decent amount of heat, and he suspected that if one stayed in a place like this for a large amount of time the stones would be constantly warm. A loud roar broke the two from their thoughts and Yugi and Ryou looked toward the cliff edge just in time to see large black wings come into view, followed by a head with two searing red eyes glowing on it. The dragon gave another roar as it landed on the outcrop, causing the whole slab of rock to shake on impact. “I better get paid extra for this.” Yugi mumbled, raising his gloved hands up as he prepared to fight.